I got the call yesterday informing me that I was moved from the waitlist and offered a seat. Looks like the deposit deadline has passed and they are filling the unclaimed seats. Retirement arrives, what would you want to go back and study? Not to ever practice, but I’d like to go back and study law just to understand it better. Best undergrad class at UT-Austin I took was Intro to Bus Law taught by a practicing attorney and first two exam scores combined weren’t a passing grade because I didn’t understand what he was wanting on the exam (don’t take a side but explain both viewpoints). Must’ve finally figured it out since I got a C in the class. Easy one for me. Practicing Astronomy. We are such a speck of nothing here compared to the inconceivable vastness of just our own galaxy...then throw in billions of galaxies. Yea, that's the stuff that matters. If we could get a few of our world leaders to view the earth for the fragile ball of glass it is, maybe they would not be trying to break it. This list gets longer every year. Physics, law, classical piano are just the three that I can think of at the moment. Constantly fascinated by sociology and feats of civil engineering. I took an Urban planning class back in undergrad and that was cool stuff. Languages. I received my acceptance to the joint JD/MA (American Colonial History) program at the University of Virginia as I was about to begin my second year of PA school. Three years too late, and I still don't know how they even found me. Khan Academy has a large O-chem section for those of you who are definitely not right. Have at it. The last week of every year I donate to Khan and Wikipedia as a present to myself. No danger of them reaching me unless they swim into a fast food lane, a Mexican food restaurant, or my sofa. Congrats to everyone who got in! Especially you David! Trying to stay positive! During the interview they said the majority will be told in February, so for everyone who hasn’t heard yet let’s not despair! Hope everyone has happy holidays! PA school is almost 3 years in most cases. There are Med Schools that are 3 years (LECOM, UC Davis Primary Care etc) Lateral Mobility is going away in the future in my opinion plus once you have established yourself in one specialty I do not see a good reason to move to another (Just my opinion). I agree with everyone else that if you are young (under 30) and have little to no medical experience (shadowing and scribing dont count IMO) go to med school. My bad, that's what I meant. Poor word of choice on my part. Thank you so much for your kind words. I am really hoping that you recieve an acceptance offer soon. I also heard at the time of the interview that most will not hear back until early February. There is still plenty of time so keep positive thoughts. Waiting is the hard part. Happy holidays to everyone! The Class of 2020 will start a Facebook group sometime in January 2018 for those who have been accepted into the Class of 2021 and submitted a deposit. We will post on the forum once the facebook group has been created. Enjoy your holidays! Mechanical Engineering. I’d loved to have a hobby shop in the back yard and build stuff. A little overkill, but I’d enjoy the process. Hi! I was until today and the waiting is killer. I'm not sure if you have any outstanding pre-reqs but I sent Judy grades from this semester on Wednesday and received an interview invite today (Friday). So I guess they were waiting for those to be finished before they made a decision. Good luck I hope you hear something soon! Well after 6 months of waiting I finally received an interview invite! I am so excited and nervous! I'll be interviewing February 15th! If anyone has any tips it would be much appreciated :) Congrats to everyone who has been accepted!! I interviewed on September 19th and was waitlisted around November 5th if I remember correctly! I wasn't in touch with anyone from the school since I was placed on the waitlist, and received email of my acceptance this week! Hope that helps, and best of luck! Looks like it :( All that pent up anticipation for today... Here’s to another week friends! I called the school today and they told me that the admissions committee will start reviewing applications after the deadline has passed (which is January 15th) so this is a good reason why we have not been hearing much of anything for some time. Hope this helps to clear some confusion up for you. I absolutely agree with you, but in Emed’s defense, I would say this is true of any procedure we do. I would say shave biopsy is an easy procedure, but one needs to know when it is appropriate, when another biopsy technique is more prudent, etc. I think all he means it’s easy to become technically proficient as opposed to say, vasectomy, that requires more hands on. Just got off work and saw my interview invite for the 20th of January! I'm ecstatic! Honestly, I can't even believe it! Can't wait to meet everyone! Or next week before christmas? Kind of late already. Coz I think the university would be closed by then. I personally was in the 8 am Group A interview on 12/1. I am not sure how many have received acceptance notices so far. So by looking back on the past forums, for the last four years, the first acceptances and waitlist emails have been announced on the second or third Friday of December. Since last Friday no one heard back, we are hoping today would be the day! Ofcourse that could always change... lol But keeping my fingers cross that they continue with their pattern! Just got an interview invite for January 20th! So excited! Point of parliamentary procedure! They will never do swimming, because it doesn't look impressive to onlookers. "HYDRATE!!" I have some ex-in laws that are cult joiners, and they have eagerly adopted and bombed out of both Crossfit and one of the pyramid schemes. I heard they are signing up for a national time-share RV vacation resort thing. I'm waiting for the Scientology folks to find out about them. There can be significant difference between an MD and PA or very little depending on the practice. In EM if you want to work on the really sick patients, the traumas, what others may perceive to be the exciting stuff, MD is the sure fire route. Assuming you match, etc. You can do that as a PA but it will require additional effort and time post graduate. Read: residency, experience, finding the right hospital, etc. The cost between PA and MD is significant in my opinion. With the most valuable cost being time, followed by money . I went to school for 23k, tuition is a lot higher now so it may be a wash. Regardless you need to consider 4 years of med school + x years of residency (if you match) and however that will affect your personal relationships and your quality of life. That is the true cost in my opinion. Q and A with current students! Where do most students live their first year? Stanford Medicine has a LOT of money, and it is very apparent with the program. The facilities are impeccable and resources are near limitless. While the website and program descriptions really emphasized becoming leaders, the one thing that surprised me was how Stanford encourages specializing and specializing - in contrast to many programs that push more general primary care. In retrospect, given how academic Stanford medical school is, this should have been expected. Some of the faculty we were introduced to are involved in the most subspecial of subspecialties, for lack of a better description. If you have a niche interest in medicine, I guarantee there will be a PA or MD or PhD at Stanford that they will put you into contact with. They additionally spent a lot of time discussing the scholarly concentrations, which I think is important since this is a clear distinguishing factor from other programs. The concentrations do require taking a certain number of extra classes on top of the core PA curriculum, which can include classes from the law school etc based on your scholarly concentration. The core classes are heavily integrated with the medical school - they really become your peers, and I think that is smart as these future doctors will have a better understanding of the rigors of PA education and therefore respect for the PAs they will one day work with. Also, I love food. The dinner was delicious. I also really appreciated that the students sent faculty out for the Q&A so that everyone could be more candid and genuine about what they like and dislike. Obviously, kinks are still being worked out, but overall the students seemed very pleased with their decision to attend the program and the opportunities afforded to them. Just based on my previous couple of interviews, I expected the individual interview to be far more intense, but I felt my panel interview was quite casual. Standard questions that you should expect to answer at any interview, and then questions based on your application. I personally wished the whole thing could have been compacted into one day, but I am no stranger to the Stanford campus and surrounding area so I felt no need to take a tour / explore further. It also seems like they really want to hire their own graduates to stay at Stanford, so if you like Palo Alto/the bay area and want to stay there after schooling, I can understand this would be a huge plus. How to refuse to Rx narcotics to chronic pain patients? Agree with the EM folks above; I'll refer people for emergent follow-up (e.g. splinted fracture that'll need surgery in a few days), but beyond there you get a name and a phone number to call for the most part. I wouldn't know the first thing about filling out paperwork, managing insurance rules, etc. One nice thing that we've started doing at my hospital is having our patient follow-up nurses help to facilitate referrals to specialists. We can click a button in EPIC doing our discharge papers and send a message to these nurses to either help the patient get a PCP, or help them get scheduled with a specialist. It's not uncommon to hear from patients "I called XYZ specialist and I can't be seen for 2 months"; our nurses can help to pull some strings and help to get them in to see someone sooner. Yes I am. We should start a Facebook page if there isn’t one yet. I think what some people don't realize is that, the older you get, the longer ago were your earlier grades in college. At 38 (I'm guessing) you are not the same person you were when you were 28, let alone 18. There will be some that wonder about your ability to succeed in a tough, masters-level program, and so it is important to have great grades in your most recent courses. Your maturity and experience should come out during an interview, so a key probably is to write a great cover letter and essay so you don't get filtered out by someone only looking at grades. I'd sure vote to interview you, based on the facts you shared. Don't lose hope and best of luck! State PA association job boards, University job boards, HealtheCareers, or organizational job boards. Undergrad Ed School: University of Pittsburgh, December 2017 Cumulative Undergrad GPA: 3.54 Science Undergrad GPA: 3.47 prerequisites still in progress: None that are needed for PA school, just finishing 15 credits for my degree Age at application time: 21 GRE: V- 152 (55%) Q-160 (76%) W- 4.0 (59%) Healthcare experience: EMT~ 980 hours for a private company Shadowing: 15 hours shadowing an ER PA Awards: Deans List x3 LOR: The PA I shadowed, a professor, and my boss who is a paramedic Schools Applied: South University- Savannah, Tampa, Richmond, Philadelphia University, Nova- All four, Arcadia - Glenside, Midwestern University-Downers Grove, Lock Haven University, University of St. Francis-Albuquerque, Marietta College Application Submitted Date: 5/23/17 Application Verified: 5/23/17 Interview Invites: Lock Haven University, University of St. Francis, Arcadia University-Glenside, Nova Southeastern: Ft. Lauderdale, Ft. Myers, and Jacksonville Denied: South Richmond, South Savannah, Philadelphia U, University of St. Francis, Nova Ft. Lauderdale Withdrew Application: will update Waitlisted: Arcadia University, Nova Ft. Myers Accepted: Nova Ft. Myers and Nova Jax! I just walked a brisk pace to the kitchen to grab a beer. A bit of chest pain and some mild dizziness when I got back to the couch but, this too shall pass. It looks like they've reposted it: http://staffjobs.ua.edu/?job=503887 But now the salary says "based on qualifications". If nothing else, E, you got them to hide their low ball offer. How come you posted this in international? Granted Pennsylvania is full of sad weirdos, but it is still part of the good 'ol USA. I got an interview invite today from Touro Manhattan for December 18th! I submitted my application July 30th. Anyone else notice all who have been accepted have been from October 16th and November 1st interview dates? Has anyone been accepted that interviewed on other dates besides these two dates? I usually don't engage in arguments on topics like this, because they usually don't lead anywhere since most people's minds tend to be firmly made up about these notions. And I don't want to give you heat, but point out some facts that you are missing. The most important one being that PAs are already practicing medicine! In many areas like primary care, urgent care, hospital medicine, etc... at almost the same capacity as their physician colleagues. 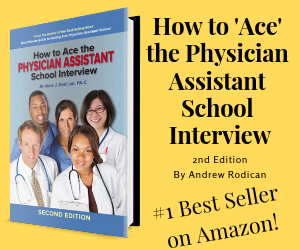 The second important point is that practicing PAs have already passed an actual medical board exam, which allows them to get licensed by state MD/DO boards and practice medicine to begin with! So they have also shown that they can pass medical boards, which is the purpose of the MCAT, to check if you have the aptitude to pass standardized board exams. Do pre-requisite courses have value? sure. Some of the more basic courses like general chemistry tend to be more practical, which is probably why Organic chemistry comprises such a small percentage on the MCAT. Allot of what you are referring to is applicable to college kids who want to go to medical school, or anyone with no significant medical background, and things like Organic chemistry and the MCAT are good tools to determine if they have what it takes. Most of it is overkill, because there aren't enough medical school seats to accommodate every capable candidate. This is ironic since everyone is always complaining about a big physician shortage! They are not however applicable to someone who has already been through the grueling process of PA school and proven themselves by demonstrating intellect and stamina, considering the rapid pace of PA training, and demonstrated the ability to competently practice medicine. When you are interviewing a job candidate with years of experience, you don't evaluate them the same as you would an applicant at the entry level. What do you hope to achieve by suing the school - reinstatement? What makes you think you would do any better a second time around? Not to be overly harsh, but you were placed on probation your very first semester for falling below a 3.0, and then failed to maintain a minimum GPA during the semester immediately following, so you got the boot (by the way, "just below" is still below). It seems pretty straightforward to me. Semesters 3, 4, and beyond are going to be hard, too. It's pretty standard for these programs to cut as many people loose the first semester or two, when it becomes evident that they won't do well. At least you didn't get cut during the final didactic semester, or the clinical year (seen both happen). I've heard of people in your situation try to make lemonade out of lemons - go back and repeat pre-reqs, get more HCE, try to convince an ADCOM somewhere, somehow that they are worth a second shot at PA school. I'm not sure how any of those people have done, but it seems like a tough road. I've heard of other folks that see the writing on the wall, and decide to try another discipline - but if you don't have the insight to understand why you performed poorly the first time around, you could just be setting yourself up for a repeat experience (I went to school with a girl who failed out of PT school before she matriculated with us, and then failed out of PA school). What I think a lot of people do in your shoes (and probably what I would do) is go the RN route. Less competitive entry, less rigorous academics, decent enough job at the other end. Plus the option to go into all sorts of advanced practice fields (CRNA, the many flavors of NP, etc.) later down the line, should you choose to do so. The absolute worst thing I think you can do in this situation is sue the school, and blame everyone but yourself for your failure. The student handbook? It's just a document, if it isn't clear to you, seek clarification before it's too late. Your PA program director didn't chase you down personally and give you a pep talk? Do you realize how ridiculous that sounds? Does PA program GPA matter? I think you also have to consider that you don't know what the future holds for yourself or the profession. I didn't realize when I was skipping classes fifteen years ago that those grades would come back to haunt me when I decided to become a PA, because I didn't know that was in my future. In another fifteen years, you might want to switch specialties and find you need to get into a residency to do that. You might want to get into a doctoral program. You might discover a whole new world of PA-to-MD bridge programs have opened up. And in any of these cases you won't be able to GPA-repair your PA school grades the way you could with undergrad. I don't think any of these speculations are reasons for you to seriously stress your GPA, but they're reasons to not ignore it's significance either. I actually keep a high GPA partly to ward off stress -- I go into every exam knowing I'm free to bomb it and still keep my seat secure. I know I can take a serious hit to my productivity -- illness, death in the family, whatever -- and push through without getting the boot for a low GPA because I've kept it high up until this point. The main thing, though, is that you're learning medicine. Your future job may rely mostly on you being a "PA-C", but your patients' outcomes are going to sometimes depend on you actually knowing crap beyond the bare minimum. Doctor I don't want to be a patient of.